In the summer of 2012 a phenomenal thing happened on the summit. Through a sequence of remarkable events, 3000 acres of prime open space on the summit was conserved for public access by a coalition of organized groups and individual citizens. 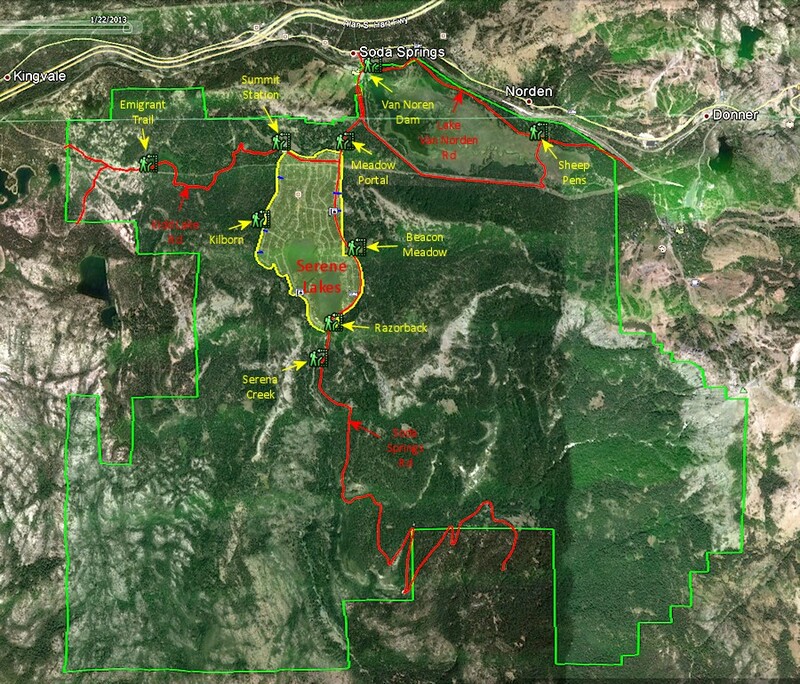 The land is now owned by the Truckee-Donner Land Trust (TDLT) and the Trust for Public Lands (TPL) and will be conserved as public open space. When this land is consolidated with the tracts of US Forest Service public land it forms a contiguous area of more than 9500 acres of publically accessible land on the summit. 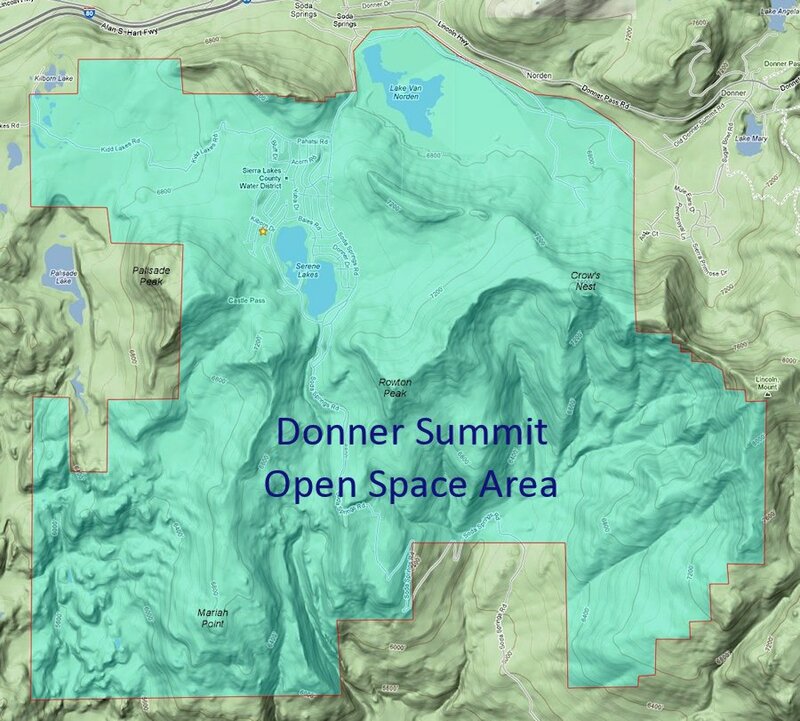 In this article the area will be referred to as the Donner Summit Open Space Area (DSOSA). Figure 1 is a preliminary map of the area that I have constructed. Now that this extraordinary acquisition has been accomplished, it is time to start planning how this area will be converted into an open space area for all to enjoy. Fortunately, as an organization that has successfully conserved thousands of acres of land in the Sierras, the TDLT is very experienced in the stewardship of open space. One need just look at the wonderful operations they have set up at Independence Lake, Waddle Ranch and Perrazo Meadows. Conservancy of the summit shares many of the same challenges that the TDLT has already successfully addressed in these other area and they can bring that experience to bear on the summit area. Of course the summit will also bring its own unique set of challenges that will have to be addressed. The next few years will see an ongoing effort to optimize the area so that there is a balance between conservation and public use. In this article I would like to address some of the challenges that I think we should all start thinking about as the process begins. No one can deny that the summit is a place of extreme beauty. However, we also can’t deny that it is not a pristine wilderness. The summit area has been inhabited for thousands of years, first by native Americans and more recently by settlers from the US. The summit has always been an important transportation corridor, one in which millions of travelers have passed through the area. The land has always been very sparsely settled although large populations of workers have temporarily inhabited the area as roads and railroads were built. Historically the area has seen many different uses from ice making to sheep herding. The area is no stranger to the developmental enterprises of man. Today the area is a winter playground with no less than 5 ski resorts. While there may be less than 500 full time residents in the area, the ski vacation population can be well over 10,000 people on a busy holiday weekend. The area has been logged continuously for over a hundred years leaving only small pockets of original “old growth” forest. There has been a dam and lake that submerged a large portion of the summit valley for over 100 years. It is on this not necessarily pristine backdrop that conservancy and restoration of the area must play out. I would like to spend this part of the article considering some of the issues surrounding public accessibility to the area. Ironically, private ownership of the land, most recently by Royal Gorge, has really prevented general accessibility and minimized impact. Now that the lands have become accessible, there will be an increased impact as hikers and mountain bikers start to use the land. This is why the creation and maintenance of trails in the area will be crucial. TDLT is well aware of this and they are beginning the process of surveying the land and working with land use groups and professionals to implement a network of trails that will allow accessibility and at the same time minimize impact. Let us consider the DSOSA area as shown in the map in Figure 2. The area is bisected north/south by Soda Springs Rd with the Serene Lakes community at the heart of it (it even looks a little like a heart). On the west side of the property is Kidd Lake Rd and Lake Van Norden road winds along the northern boundary of the meadow on the east side of the area. This network of road provides pretty good access to most of the property. There are only a couple of areas at the south eastern and western corners that are more than a mile from a road as the crow flies (of course none of us are crows). In addition to the roads, as any cross country skier knows, the whole area is covered with ski trails, many of which are in parts of old logging roads. It is probable that when formal hiking and biking trails are created, they will be utilizing these trails. The map in Figure 2 shows potential trailhead locations that might be used. These locations reflect the probable entry points that would be used by people visiting the area. As the map shows many of the sites are on the periphery of Serene Lakes community which is a primary access point for most of the area. It would be important in the creation of any trailhead that it minimize its impact on the surrounding community in residential areas. It is also important to remember that the summit area is bear habitat and any facilities would have to be bear proof. 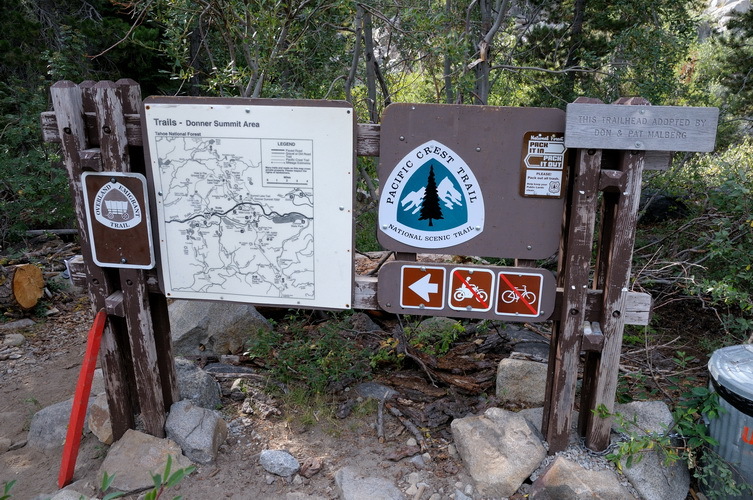 Ongoing maintenance of the trailheads would be critical. The open space of the summit area attracts all types of users including hikers, mountain bikers and equestrians. The terrain can accommodate all of these activities, but it is important to minimize any conflicts between these different modes of back country travel when the trail system is implemented. Control of these users can start at the trailheads (again an area where signage is important) and trails can be separated and consolidated where it makes sense, ie: route hikers away from steep downhill mountain bike trails. Equestrian riders present their own set of requirements and it would be prudent to minimize dog – horse and mountain bike – horse interactions. The area is big enough that with proper planning and regulations/signage, conflicts can be avoided. 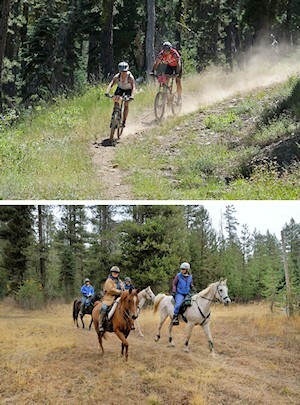 It is important for everyone to keep in mind that Placer County made a large contribution to the acquisition of the land with the stipulation that it be for multi-use including hiking, biking and equestrians. The requirement here is pretty simple. The use of motorized vehicles off of public roads within the area will be prohibited. This is also a stipulation from Placer county. It will be important that proper signage be posted to inform would-be riders. TDLT intends to post the area and also install gates and obstacles at obvious entry points and also prosecute offenders. Van Norden Meadow is probably the most sensitive area that needs protection from off-roaders (it’s also the most accessible and tempting for OHV enthusiasts) . 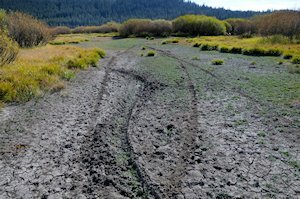 I have seen OHV vehicles out in the meadow from time to time and in many cases the riders have done significant damage (see Figure 3). Lest you think I am just a “tree hugger”, I am a long time dirt bike rider and my wife rides an ATV. We love off roading, but this area is just too sensitive. Off-roaders can ride down Soda Springs Rd or Kidd Lake Rd and there are designated OHV areas over at Prosser and near Cisco. The question of whether backpacking will be allowed in the area has not been answered to my knowledge so this section is entirely speculative. There are certainly some remote parts of the area that might appeal to a backpacker. Probably the two biggest concerns for this type of usage of the area are the danger of fire and interactions with bears. The idea that there might be campfires up on Razorback Ridge or out at Point Mariah is a little disconcerting. As I will discuss in a subsequent article, the conditions of the forests in the area make them potential tinderboxes in a dry summer. It seems that the only way backpacking might work is for the backpackers to be restricted to fire safe camp sites. The same idea would be true for preventing bear interactions. Currently, the summit area is relatively free of bear intrusions. To maintain this condition it would be very important that back country campers avoid any interaction with bears that would prompt them to intrude on residential areas. As many long time residents of the summit know, there used to be a PG&E campground in Van Norden Meadow and a private one in Serene Lakes. There is still a PG&E campground out near Kidd Lake. The establishment of a campground has been mentioned but to my knowledge there are no formal plans for one. It is conceivable that a campground could be established and I think it would have to meet the same sorts of requirements that were described for backpacking. It would also require official environmental scrutiny as to its impact on the area. The intent of this discussion is to start you all thinking about the next phase of the conservation of the summit area. I have tried to present some of the obvious challenges to the process. I am sure I have not been totally comprehensive and there are many other issues that will surface along the way. I have offered some possible solutions that make sense to me but I do not pretend to be a land use expert and there are surely many different solutions that are possible. Maybe you have thought of some yourself as you read this article. If that is the case then I have succeeded. Thank you George. Just excellent. I am interested in your perspective on my suggestion of General Guidlines that I have added to Saturday’s SLPOA agenda.